Precisely for this reason, he was the pre-eminent builder of social science institutions. Dr. Rao established three great national institutions—the DSE; the IEG; and this institution, ISEC—and was also instrumental in the creation of a number of international institutions. The idea for the Delhi School was hatched when he and Pandit Nehru were in the UK. One of my favourite stories concerns Dr. Rao’s first recruit to the Delhi School . DSE had advertised for an ordinary readership position, only to find that the great KN Raj had applied. Dr. Rao rejected the application and unilaterally offered him a prestigious professorship instead. Given Dr. Rao’s abiding interest in research and his faith in its social value, I think my choice of subject today is not altogether misplaced. As the title suggests, I want to speak today about the state of macro-economic policy commentary and research. Macro-economics is central to the work we do at the Ministry of Finance and the RBI. Many key policy decisions are driven and underpinned by an assessment of the macro-economic situation. 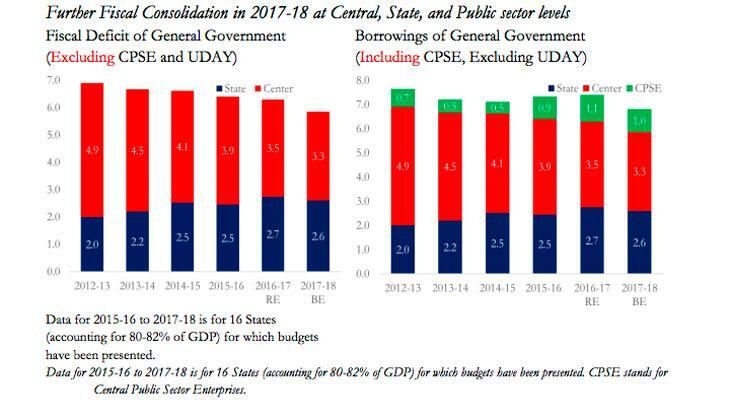 So, whether the fiscal deficit should be higher or lower, whether public investment should be increased or decreased, whether interest rates should be increased or lowered are all questions critically dependent on our assessment of the current state of the economy and where we think it is headed. In fact, the MOF and RBI are far from the only bodies that give advice. Assessments of the macro situation are -- and must be -- the result of a far wider process, in which inputs are also provided by experts in the private sector, academia, and civil society. In each case, experts could be Indian or foreign. As an insider, I am an eager consumer of the opinions of outsiders. Indeed, as CEA, I have now read a fair amount of commentary by analysts and journalists. What I see is a clear pattern. And it is a worrisome one. My central thesis is this: much of this expert opinion, and not infrequently, is liable to being compromised. In short, like Emile Zola criticizing those who had unjustly framed a decorated soldier in 19th century France, J’ACCUSE! What is my criticism? My claim is that experts often hold back their objective assessment. Instead, they censor themselves, and in public fora are insufficiently critical and independent of officialdom—whether the officials are in Mumbai or Delhi. To the extent they offer criticism, it is watered down to the point of being unidentifiable as criticism. Let me immediately add two important caveats. First, what I am asserting is not unique to India; these “misdemeanors” are widely prevalent across the world. Also, I am painting with a broad brush; there are some notable Indians who are consistent exceptions to my thesis/critique. Still, what strikes me is how few these exceptions are, how infrequently the experts are willing to engage in public debate about the macro-economy. Why do the experts do this? Why do they refuse to speak truth to power? If you ask them, they would say that they are just trying to be “constructive”. But I feel something else is at work. For a variety of reasons, experts feel the need to stay on the right side of power—whether the RBI or government. So, before policy decisions are taken the experts tend to express the views they think officials are likely to take. After policy actions, they try hard to endorse the decisions already taken. As a result, we in the government do not really benefit from their wisdom. This is a serious problem, because high-quality policymaking demands high quality inputs and high quality debates. The paradox is that in other spheres—such as trade policy or development policy— one sees a more vibrant, healthy, and unself-censored debate. Why is there such little debate about macro policy? I would venture three explanations. out, from being contrarian to conventional or official wisdom. That said, I think something deeper is at work. On micro and development issues, India and Indians, are on the global academic frontier. This is less true of macroeconomics. For example, while there are many Indian economists working abroad, there is very little research on Indian macroeconomics even in the US. Part of the explanation is that there isn’t enough high frequency data to make such work interesting. But surely this is only part of the explanation. This is a matter of sociological interest that needs greater investigation. Today, I want to illustrate some of these ideas with a few examples from recent Indian experience. Before I talk about Indian experts, let me begin by highlighting one of the most egregious examples of compromised analysis: the assessments of the international ratings agencies. 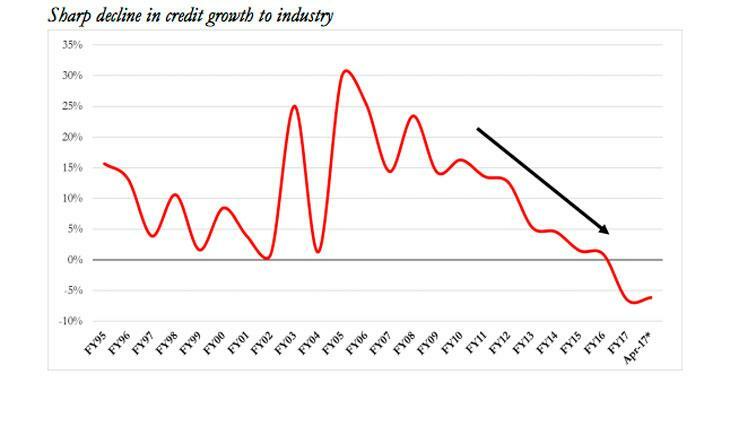 In recent years, the role of ratings agencies has increasingly come into question. In the US financial crisis, questions were raised about their role in certifying as AAA bundles of mortgage-backed securities that had toxic underlying assets (described in Michael Lewis’ The Big Short). Similarly, their value has been questioned in light of their failure to provide warnings in advance of financial crises. Often ratings downgrades have occurred post facto, a case of closing the stable doors after the horses have bolted. 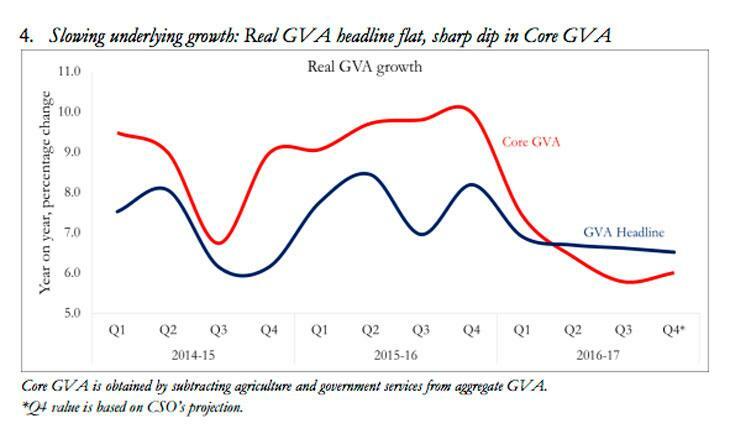 In recent years, rating agencies have maintained India’s BBB- rating, notwithstanding clear improvements in our economic fundamentals (such as inflation, growth, and current account performance). 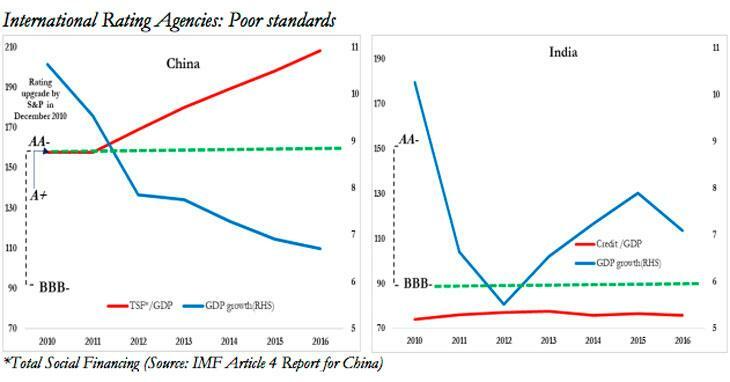 At the same time, China’s rating has actually been upgraded to AA-, even though its fundamentals have deteriorated, as these charts from the Economic Survey show. In other words, the ratings agencies have been inconsistent in their treatment of China and India. Given this record—what we call Poor Standards--my question is: why do we take these rating analysts seriously at all? Let me now turn to domestic examples. On the domestic side, there is a clear relationship between expert analysis and official decisions. Before policy decisions, the expert analysis is often illuminating. But once the decisions are taken, it is truly striking how the tune and tone of the analysis changes. Analysts fall over backwards to rationalize the official decision. Some examples should make this point clear. Starting from the time the FRBM was enacted, it had been an article of faith in the economic community that the government ought to abide by its strictures. About a decade ago, however, the government decided to conform to the letter of the FRBM while violating its spirit by issuing large sums of ‘off budget’ bonds to oil companies to window-dress the magnitude of the fiscal deficit. In that instance, I recall that the response of the experts was a whimper compared to the magnitude of the concealing actions. Once the decision was made, it was rationalised, rather than challenged. A similar dynamic can be seen in the assessments of more recent budgets. Before the 2016-17 and 2017-18 budgets were announced, outside views spanned the spectrum. 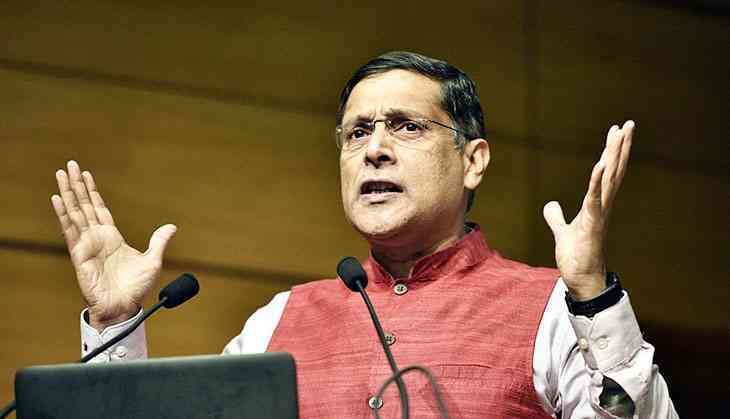 Some urged the government to stick to the pre-announced target, others to go slow on consolidation; some even asked for expanding the deficit, especially this year, given the weakness of the economy after demonetisation. Yet whatever their initial view, once the budget was announced, commentators almost uniformly endorsed the actual government policy. One would have thought that they would at least be mildly embarrassed by their change of views. But they gave no sign of such embarrassment; indeed, they didn’t even admit they had changed their views. Perhaps the epitome of this dynamic can be found in the assessments of monetary policy. Consider how expert assessments have evolved, just over the past few months. After de-monetisation, a consensus had built up amongst the investor community and the economic analysts that the RBI would cut interest rates. 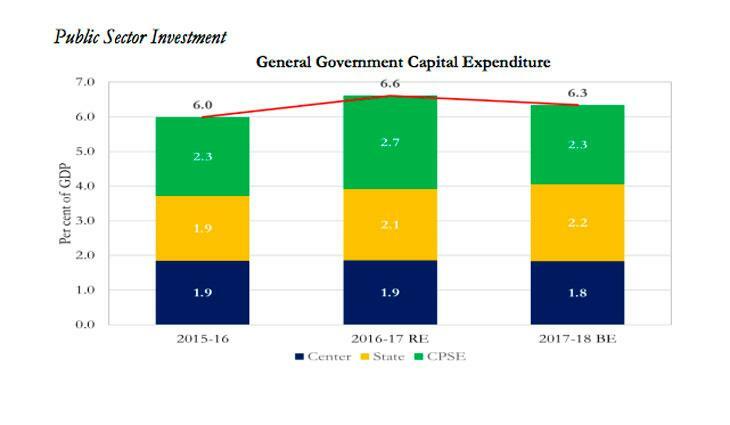 This consensus was based on (a) a declining trend in inflation from Q2 FY17 and (b) the projected short-term adverse impact of demonetization on growth. It turned out that the MPC did not cut. Instead in December, it signaled a more hawkish stance (going from accommodative to neutral), and since then has maintained that stance. Yet instead of criticizing the official decisions, as consistency would demand, analysts found ex-post logic to attribute merit to these decisions. That is, far from criticizing the central bank for holding rates constant over the past three announcements, analysts praised the policy stance as prudent and helpful in boosting the credibility of the inflation-targeting framework. While the RBI’s decision may well be commendable, it is odd that before December experts saw no inconsistency between a rate cut and the credibility of the central bank. To be fair, some change in position could be warranted either if the official assessment revealed something about the economy that analysts did not previously know or if they learned something new about the RBI’s preferences or reaction function. Since December, there was perhaps one new aspect of preferences that markets did reveal: after some ambiguity in September, the MPC has only subsequently (in February 2017) made clear that its target is 4 percent not say 5 percent. Even allowing for this, the analysis and commentary has remarkably toed the official line post facto. My second point is perhaps even more fundamental. I want now to present a macroeconomic update of the economy. Treat this as not my update or that of the Ministry of Finance but that of a disinterested observer who has just landed from Mars (say brought home by our satellite Mangalyaan). The bottom line from this analysis is that inflation pressures are easing considerably; the inflation target has been over-achieved; the inflation outlook is benign because of a number of economic developments. 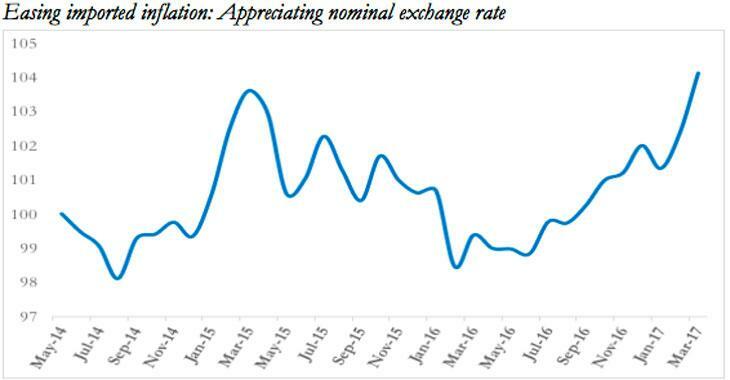 Real activity remains weak and well below potential, the exchange rate is appreciating denting exports. Against this background most reasonable economists would say that the economy needs all the macroeconomic policy support it can get: instead, both fiscal policy and monetary policy remain tight. And on top of that, there are some officials who even think that policy should get tighter. 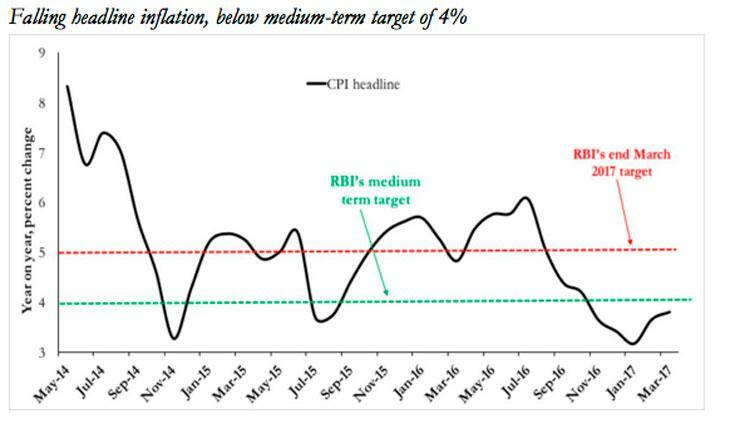 - Have they (and here I mean the thrust of opinion emerging from the analyst community) highlighted that we have over-achieved on inflation well in advance of scheduled targets? 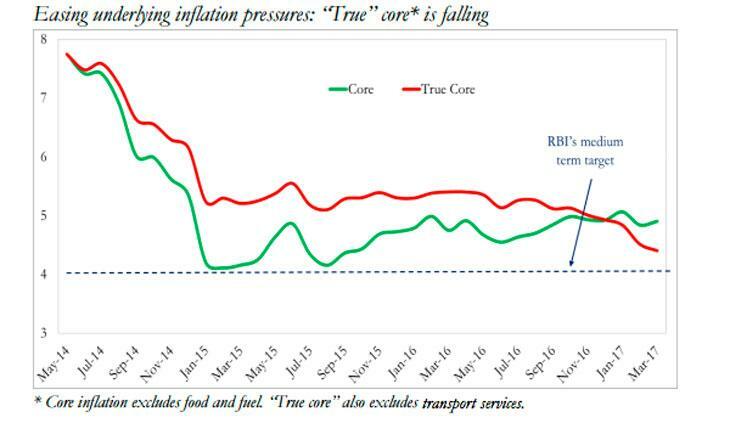 - Have they highlighted that core inflation—properly measured—has been declining steadily over the last 7 months and is on target to achieve the medium term inflation target? - Have they highlighted that an appreciating exchange rate will dampen inflation going forward? 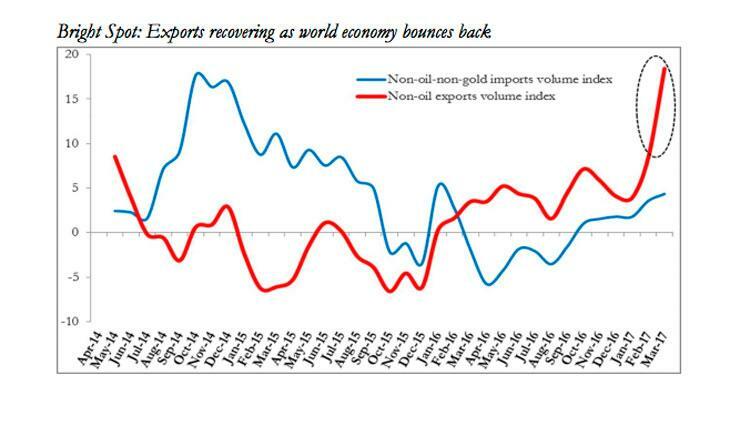 - Have they highlighted that ritual invocations that oil prices could increase because of geo-political risks are less plausible today because oil markets have fundamentally changed, placing ceilings on oil price movements? - Have they highlighted that perhaps real activity could be recovering slowly, not rapidly, and hence that output gaps could be widening, moderating inflationary pressures? - Have they highlighted that fiscal policy has been tight (and to borrow from Paul Krugman’s phrase perhaps even ‘irresponsibly responsible’?) and that public investment has not significantly increased at a time of weak private investment? 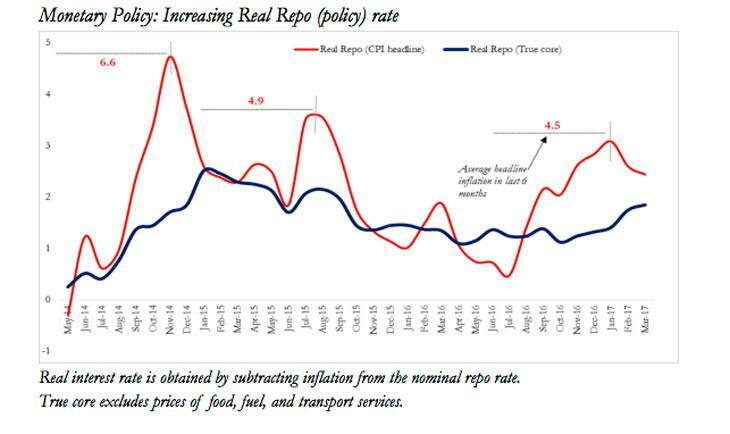 - Have they highlighted that even though liquidity conditions have eased (perhaps alarmingly), the real policy rate is at a recent high and at the previous high, inflation was much greater? In sum, have they highlighted that inflation is under control and activity may be weakening, calling for all the fiscal and monetary policy support that the economy may badly need? There is a famous joke about asking three economists for a view and getting four different answers. Today there are hundreds of economists outside the government and RBI and several within. Instead of getting a hundred plus views, we get about ONE view, the official view.Even more interesting that about 12 months ago, when inflation was much higher and growth was higher, there were economists who called for a large cut in interest rates. Yet today they are silent. Let me be clear. The alternative view that I presented—which is at variance with this consensus view both on the assessment and the policy prescription—is not necessarily my view, and may not even be the right view. But it is an eminently plausible view that must be part of the policy discussion; and yet we have not heard it, or even anything close to it. I find this a somewhat disconcerting commentary on the state of macro-economic commentary in India. I do not want to bore you with more details. But similar things have happened in early 2015, when there were two successive rate cuts in between monetary policy meetings. Inter-meeting cuts are supposed to happen exceptionally, and that too only in response to new and unforeseen developments, but the commentary was surprisingly incommensurate with the actions. Another example relates to liquidity conditions in two episodes (the first in late 2015 and the second in the period following demonetization) when policy announcements and actual liquidity conditions have diverged in a manner that would have been the object of insistently serious commentary in other countries but in India have been greeted by indulgent acquiescence on the part of commentators. If what I have argued has some validity, some conclusions follow. We need more disinterested voices—especially universities and independent researchers that are distant from and not dependent upon the apparatus of power—to speak up. This may require us to beef up capability in macro-economic teaching in our universities so that we can build up the intellectual confidence for people to express contrarian opinions. In substantiation of this point, look at the FRBM debate. I am really heartened by the debate emerging around the FRBM report. But note that this debate is gathering steam because of the thoughtful contributions of independent voices such as Professor Indira Rajaraman and Professor Pronab Sen. The investor community reported on the FRBM as if there was unanimity of views which there was not. Another conclusion relates to the behavior of officialdom. All officialdom wants validation for its actions. So, in the short run, it will want to shape opinion in its favour. But in the long run that is perhaps not desirable. Public interest is perhaps better served by richer debate that encompasses critical views, including of officialdom. Officials should signal that clearly. As I conclude, the opening line of a famous essay, Of Truth, by Francis Bacon— considered the father of the scientific method—comes to mind: “What is truth? said jesting Pilate, and would not stay for an answer”. In this post-truth world, with nonoverlapping echo chambers of opinions, perhaps Pilate would have wearied of even asking the question. But one thing is certain: truth, no matter how elusive that notion is; the discovery of which, no matter how hard that search is going to be; requires diversity of opinion. That diversity will require both competence and capability. And above all, it will require voices that are not silenced, compromised, or conveniently moderated by the lure or fear of power. I believe that the great Dr. VKRV Rao, institution builder and independent-minded academic par excellence, would have endorsed these suggestions.